Feb. 24, 2013 – The Children’s Medical Center Research Institute at UT Southwestern has deepened the understanding of the environment within bone marrow that nurtures stem cells, this time identifying the biological setting for specialized blood-forming cells that produce the infection-fighting white blood cells known as T cells and B cells. 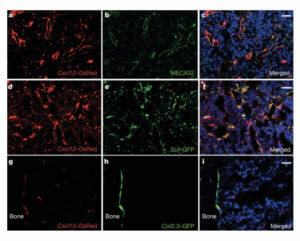 The research found that cells called early lymphoid progenitors, which are responsible for producing T cells and B cells, thrive in an environment known as an osteoblastic niche. The investigation, published online today in Nature and led by Dr. Sean Morrison, also establishes a promising approach for scientists to map the entire blood-forming system. Scientists already know how to manufacture large quantities of stem cells that give rise to the nervous system, skin, and other tissues. But they have been unable to make blood-forming stem cells in a laboratory, in part because of a lack of understanding about the niche in which blood-forming stem cells and other progenitor cells reside in the body. These findings eventually may help increase the safety and effectiveness of bone-marrow transplants, such as those needed after healthy marrow is destroyed by radiation or chemotherapy treatments for childhood leukemia, Dr. Morrison said. The findings also may have implications for treating illnesses associated with loss of infection-fighting cells, such as HIV and severe combined immunodeficiency disease, better known as bubble boy disease. The Nature study augments earlier work by Dr. Morrison and his team that showed endothelial cells and perivascular cells lining the blood vessels in the bone marrow create the environment that maintains haematopoietic stem cells, which produce billions of new blood cells every day. The latest study shows that bone-forming cells create the environment that maintains early lymphoid progenitors. The UTSW paper’s first author is Dr. Lei Ding, a former postdoctoral research fellow at the Children’s Research Institute and the Howard Hughes Medical Institute (HHMI) at UT Southwestern. Dr. Ding is now an assistant professor at Columbia University. Research support came from the HHMI and the National Heart, Lung, and Blood Institute.